by Gwendolyn Brooks (1917-2000) open to all Illinois residents over the age of 18. 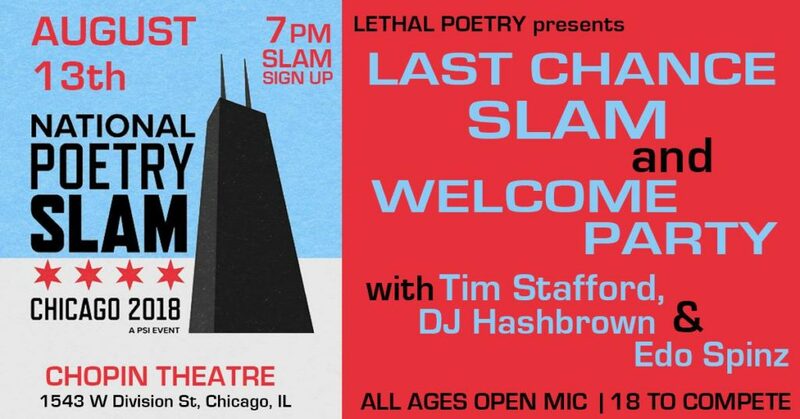 The top contestants selected by guest judges from the poetry community are invited to perform their original poems at the live finals event, where the audience favorite is awarded the $500 prize. 2018 marks GBOMA’s 25th year! ALWAYS a crowd pleaser, this year will be particularly special. Make your voice heard! Join us on September 18th and be a part of choosing the 2018 winner! Doors: 6:30, Show: 7pm. All ages. The 2018 Finalists have been announced! This year, as last year, the Judges have also chosen alternates worthy of special mention. These poets will compete against one another in an opening wildcard round on September 18th, the winner of which will go on to compete in one of four semi-final rounds. & Thanks to all the wonderful poets who submitted! We hope to see you at The Promontory on September 18th! Tara Betts is the author of three poetry collections: Break the Habit, Arc & Hue, and the forthcoming Refuse to Disappear. She co-edited The Beiging of America: Personal Essays About Being Mixed Race in the 21st Century and edited a new critical edition of Adventures in Black and White, the long out-of-print memoir by Harlem-born, interracial child prodigyPhilippa Duke Schuyler. She holds an MFA from New England College and a Ph.D. in English from Binghamton University. 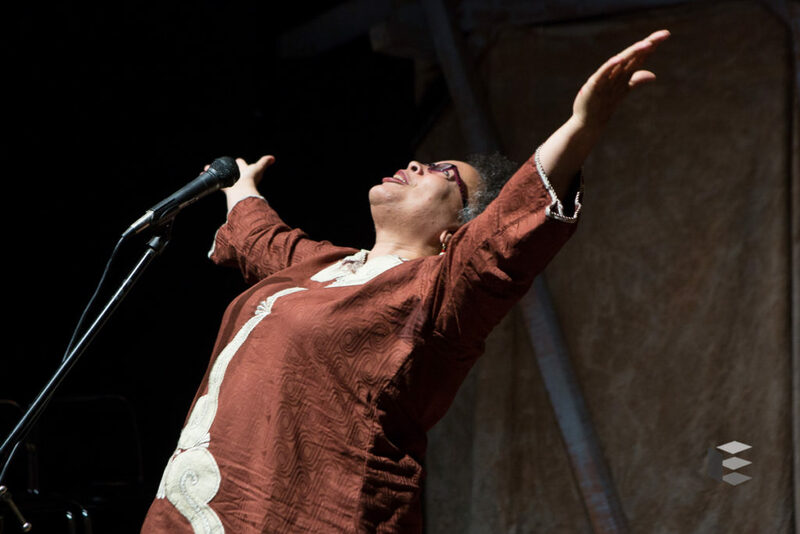 Her work has appeared in numerous anthologies and journals.In addition to representing Chicago on two slam teams, Tara won the 1999 Gwendolyn Brooks Open Mic Award. Tara started her teaching career in Chicago by working with organizations like Young Chicago Authors, Gallery 37, AfterSchoolMatters, FreeWrite Arts & Literacy, and many others. While teaching on the East Coast, she worked with young poets at Urban Word NYC and taught at Rutgers University. Dr. Betts currently works with students at ChiArts High School, Chicago State University, and with participants in the Prison + Neighborhood Arts Project at Stateville Prison. Past winners include the esteemed poets Sename Amagashie, Lucy Anderton, Tara Betts, Lisa Buscani, C.C. Carter, Stephanie Gentry-Fernandez, Marian Hayes, Tricia Hersey, Tyehimba Jess, Langston Kerman, Toni Asante Lightfoot, Nate Marshall, Sage Morgan-Hubbard, Stephanie Rose Perez, Tristan Silverman, Dan “Sully” Sullivan, Mark Turcotte, Deepak Unnikrishnan, Javon Smith, Nicole Bond, and last year’s winner, Vann Harris. Check out the full 2017 Gwendolyn Brooks Open Mic Awards through CAN TV. 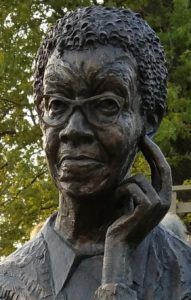 Pulitzer Prize winning Chicago poet Gwendolyn Brooks (1917-2000) founded the Gwendolyn Brooks Open Mic Award twenty-five years ago. Brooks was born in Topeka, Kansas and lived in Chicago for the rest of her life. She was the author of more than twenty volumes of poetry and numerous other books. Her many awards and honors include Poet Laureate of Illinois, Consultant in Poetry to the Library of Congress, American Academy of Arts and Letters award, a Pulitzer Prize, the Frost Medal, a National Endowment for the Arts award, and fellowships from The Academy of American Poets and the Guggenheim Foundation. Participant must be 18 years of age or older by the last day of the submission period. Participant must be a permanent resident of Illinois. Submit one (1) original poem. No exceptions. Poem must be previously unpublished. When performed, the poem cannot exceed three (3) minutes. Poem must be submitted as .DOC or .PDF file in a legible 12-point font. Poets must be available to perform their poem at the live GBOMA event. If selected as a competing semi-finalist, attendance at the event is mandatory. You will not be considered for the prize if you are not able to perform at the event. Contestants will not be able to use props or music or any accompaniment outside of their voice or body during the performance of poems at the competition. Incomplete applications or applications that do not follow these guidelines will not be considered. Previous winners are not eligible, but previous applicants and semi-finalists are encouraged to re-submit. Deadline to submit for 2018 is now 11:59PM on August 17th, 2018. Late submissions will not be accepted. The online form will confirm that your poem & payment has been submitted. You may want to save that confirmation page for your records. If you are unable to submit your poem and payment through the online forms, please email GuildComplex.Programs@Gmail.com well in advance of the deadline to make alternate arrangements, we will do our best to accommodate your needs, but no extensions will be granted. Semi-finalists will be notified by email by September 5th 2018, and will then perform their 3-minute poem in the live semi-finals at The Promontory on September 18th 2018. If you have questions, please read the FAQs below. If you do not find the answer you need, write to us at: GuildComplex.Programs@Gmail.com. What if my poem is really good, but it’s more like three-and-a-half minutes long? Picking a poem that fits comfortably within the time limit makes the best possible evening for your audience, your fellow competitors and you. The three-minute time limit will be strictly enforced. Choose a poem that you can perform carefully and clearly in the time allotted, and your work will be heard and enjoyed – and not cut short or rushed. What if I don’t like performing my poetry? Can someone else do it? 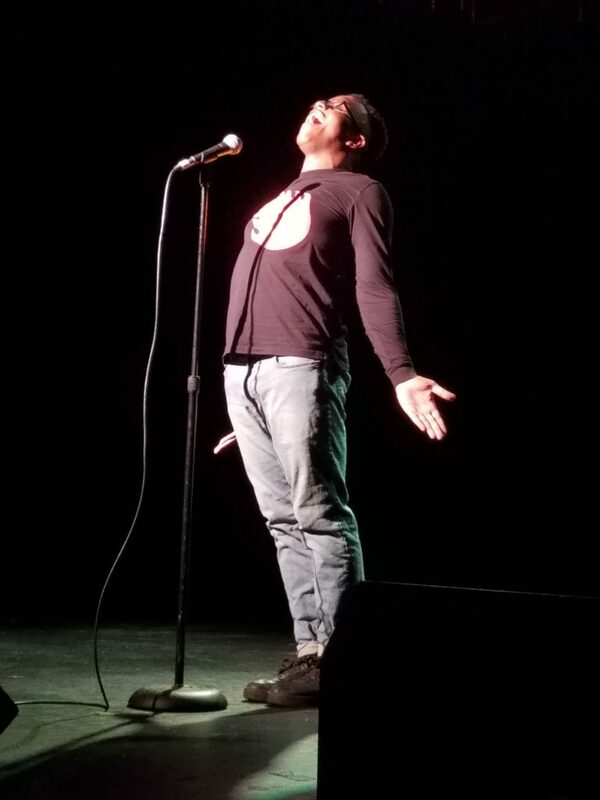 Some poets don’t like to perform. That’s ok. But like a lot of events with the Guild, we want to bring writing to life for our audiences. And we know no one can do that for your poem better than you! I have a wedding/job/date/etc on September 18th. Can I leave the competition early/come late? We decide the order of performers that night, so you have to be available for the full event. Besides, you won’t want to miss any of the other excellent poems. If chosen as a semi-finalist, do I have to memorize my poem? That’s up to you. But whether you read it or recite it from memory, make sure you know it well enough to perform it in an engaging way. What’s up with requiring a submission fee? I’m not a rich poet. We understand. But the submission fee helps offset part of the Guild’s costs for the event, PLUS your submission fee allows you entrance into the event whether you are selected as a semi-finalist or not. Do I have to pay my submission fee online? Yes. At this time our limited staff support makes this the best way to process entries quickly and accurately.